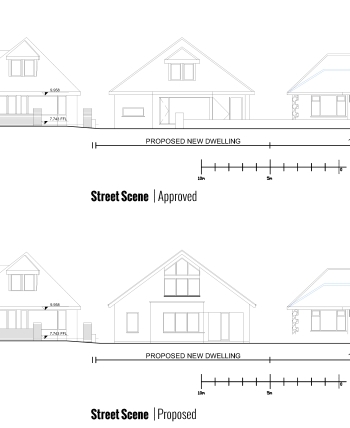 Bournemouth Borough Council: Pure Town Planning are pleased to announce a recent appeal win to turn an extant permission for a hipped roof chalet bungalow into a contemporary front and rear gable chalet bungalow with a design by Tony Holt Design. Following an approved application for a hipped roof chalet bungalow, the applicant instructed Pure Town Planning to undertake a minor material amendment application to change the extant permission to his preferred design of a front and rear gable. Despite our strong justification for the design change, the Bournemouth Borough Council deemed the amendments would be harmful to the wider character and appearance of the area and refused the application. Following a full assessment of the reasons for refusal, we considered that there a strong change of success at appeal. Once instructed, the appeal statement was written to demonstrate that the character and appearance of the area was mixed with a range of roof forms and a wide range of architecture present in the immediate vicinity. Furthermore, it was noted that the proposed changes would not lead to any increase in floor space and ridge height from the approved scheme and that while the change in roof form would make the building more visually prominent it would not be overbearing upon the street scene. Ultimately, the Inspector agreed with our justification noting the proposal would have an acceptable effect on the character and appearance of the area and allowed the appeal much to the delight of our client.